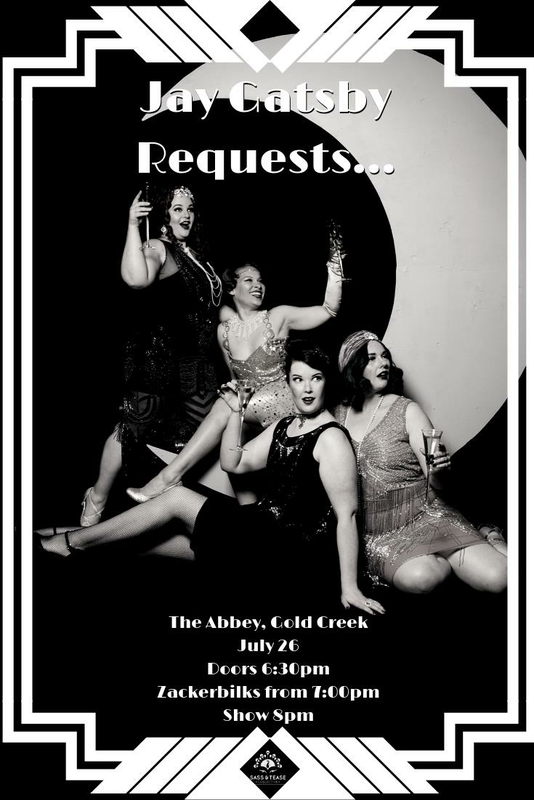 Get ready to hot-step your way back to the 1920s withthe Sass and Tease Collective! Accept your invitation to be swept back to another era,where the giggle-water flows as easily as the money. Where writers like F.Scott and Zelda Fitzgerald and Ernest Hemingway were poised to record everydepravity, every vice and every scandal that made the Roaring Twenties thewildest decade of them all. "Jay Gatsby Requests..." was the first showproduced wholly and solely by The Sass and Tease Collective. It is arollicking indulgence in the Jazz Age and the lawlessness of Prohibition,and we are bringing it back to celebrate six years of Sass and Tease! Featuring international headliners the Ballet SchoolDropouts and live music from trad-jazz ensemble Zackerbilks! It’s time to shine your shoes, don your dapperest dudsand get ready to quickstep back in time to join The Sass and Tease Collectiveand their guests for a hotsy-totsy turn about the stage. Don't be arueben, ankle your way to The Abbey with your best bearcat on your arm, knockback a jorum of skee and get ready to blow the blues!